It’s not a postcard, but it is a favorite image, showing the pneumatic mail department in the basement of an American post office. The practice of loading mail into canisters and shooting them through tubes with compressed air dates back to the nineteenth century. A pneumatic line linked the London Stock Exchange and a telegraph company in 1853, and there was a pneumatic telegraph and mail system in London soon after. 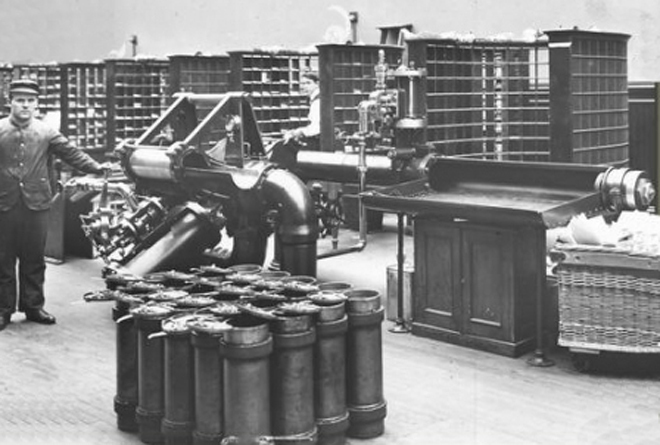 By 1909, there were more than 40 miles of pneumatic tubes running under London, and pneumatic mail in Birmingham, Liverpool, Manchester, Newcastle, Glasgow and Dublin. In 1865, the German post office in Berlin began pneumatic mail service. It was known as Rohrpost, my favorite translation for pneumatic mail — you can hear it go by. The German post office opened systems in Hamburg and Munich as well. In 1898, Rohrpost carried 2.3 million pieces of mail.